Late blight has been confirmed on tomatoes in Chatham-Kent. 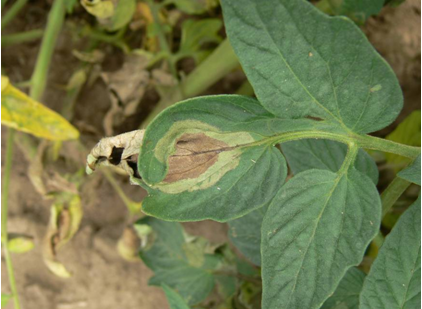 Recent weather has been conducive to the development and spread of late blight. Commercial growers should scout often and ensure they are using fungicides with good late blight activity in their fungicide program. When late blight is in the area, spray intervals should be shortened. Tighten up spray intervals – During wet cool periods, a fungicide should be applied every 5 – 7 days to protect against late blight. If the weather conditions become dry, the spray intervals may be extended. Ratings are shown for late blight activity based on information from Dr. Tom Zitter, Dept. of Plant Pathology and Plant-Microbe Biology, Cornell University, Ithaca, NY or information from other sources listed at the end of the article (*).